DENMARK: The European Commission (EC) has approved NKT Cables' takeover of ABB's high-voltage cable business, stating the merged company would continue to provide competition in the European market. In September, NKT announced it was splitting its business to enter the HVDC market by acquiring part of ABB's business. NKT currently supplies high-voltage, alternate-current cables to the offshore wind industry. Switzerland-based ABB's high-voltage business was part of its power grids division, which was under strategic review. "Based on the results of its extensive market investigation, the Commission found that the proposed acquisition would not result in a significant reduction in competition, and that a number of strong competitors will remain post-transaction," the EC said. The commission said the merger was of particular interest after ABB and NKT Cables were named as part of a cartel in 2014 and fined. Ten firms, including Nexans, J-Power Systems and Prysmian, were ordered pay a total of €302 million in fines for the illegal activities between 1999 and 2009. While ABB took part in the practices, it was granted full immunity from a suggested €33 million fine, as it was the first company to reveal the practices to the commission. When approaching offshore wind developers and other customers, the companies would share markets and allocate customers in order to undermine competition and push prices up. The firms struck agreements such as that European and Asian producers would stay out of each other's home territories. European companies also agreed to allocate projects within the European Economic Area. With the approval from the EC, NKT is now able to acquire ABB's business for an enterprise value of €712 million. 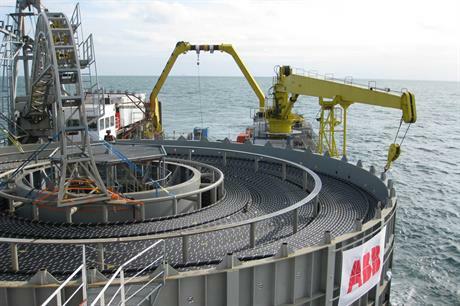 ABB is also committed to building a new €124 million cable-laying vessel, which is due to be delivered in Q1 2017, resulting in a total transaction value of €836 million. As a result of the acquisition, NKT announced in September it would separate its cable business from its cleaning equipment firm. "Both businesses will be viable, stand-alone companies and, when the acquisition is closed, it is the board of directors' intention to split NKT Holding into two separately listed companies," NKT said last year.